No Lockpicking and Pickpocketing mini-games. 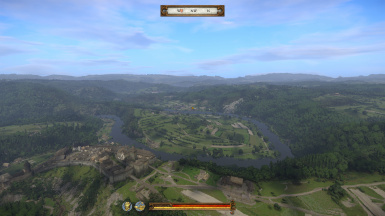 Skalitz never Destroyed The Main gates will be closed, use Cheat to get inside. -- Automatically run cheats when after you load a level. Create file Data\autocheat.txt and put 1 console command per line in the file. -- cheat_remove_all_buffs - Attempts to remove every buff in the buff database from the player's character. -- cheat_add_buff_heal - Now restores health, stamina, hunger, and exhuast in addition to bleeding and injuries. -- cheat_add_buff_immortal - Now calls cheat_add_buff_heal before adding immortal buffs. -- cheat_remove_all_perks - Attempts to remove every perk in the perk database from the player's character. -- cheat_add_all_items - Adds all items in the item database to the player inventory which is about 5300 punds of items. Don't worry somehow you can still walk. -- cheat_add_stat_xp -- Adds XP to the a player's stat like str. Rewrote in-game documentation for all commands. Can now export sorted command list and command documentation directly from code. Some command syntax was changed for consistency. This is not required but if you want console tab completion run the game with -devmode. See screenshot on how to add -devmode in Steam. If you installed the mod correctly it will print out the mod name and current version in the console when the main menu loads. Press the tilde (~) key and use the Page-Up key to scroll the console up. Type cheat and press tab (not enter) to see the list of commands. You can see the arguments to a command by running the command with a single ? argument. For example run "cheat_set_regen ?" to see usage instructions for that command. 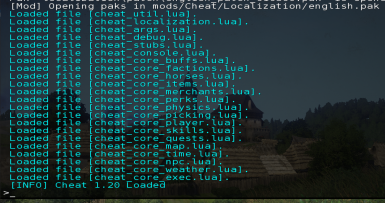 Since some cheats are temporary (they don't survive game restart) you can add cheats to a file named "autocheat.txt". 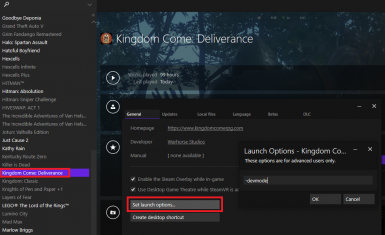 Create steamapps\common\KingdomComeDeliverance\Data\autocheat.txt and place one console command per line in the file. This file is loaded and executed by Cheat mod when a level loads not when the game loads. Fixed documentation error on command cheat_set_horse. Released additional version of mod without any key bindings. Merged the most recent defaultProfile.xml from patch ipl_patch_010400.pak so the esc button should be working in tutorial screens now. Works with KCD 1.4.1. For new games you'll need to save and reload after the initial tutorial sequence (talking to your mom) for all features of the mod to be loaded and working. The cheat_spawn command now had radius option and can spawn guards. Removed version section from mod.manifest since it works so poorly. Added required health argument to cheat_damage_all_items. Fixed startup logging so missing autocheat.txt isn't logged as an error. Added cheat_target_entity command bound to F4. Added cheat_kill_target comand to kill an entity targeted with F4 or the cheat_target_entity command. Added support for GOG versions. Fixed packaging issues causing wrong file to get uploaded to nexus. Added cheat_set_weather to control the weather. Added cheat_kill_npc to kill matching NPCs within a specified radius of the player. Added cheat_stash to open player's stash. Added max parameter to cheat_teleport_npc_to_loc to limit total number of NPCs teleported. Added max parameter to cheat_teleport_npc_to_player to limit total number of NPCs teleported. Changed cheat_find_npc, cheat_teleport_npc_to_loc, and cheat_teleport_npc_to_player to work with any actor like hare, pig, deer, etc. Added cheat_find_npc to display an NPC's location assuming the NPC has been loaded into the game world. Added cheat_teleport_npc_to_loc to teleport one or more NPCs to a specific x,y,z location. Added cheat_teleport_npc_to_player to teleport one or more NPCs to the player's location. Added cheat_teleport_horse to teleport the player's horse to the player's location. Added required "exclude" argument to cheat_add_all_perks to control excluding negative, test, and obsolete perks. F5 key is now bound to quicksave (cheat_save). Automatically run cheats when after you load a level. Create file Data\autocheat.txt and put 1 console command per line in the file. cheat_remove_all_buffs - Attempts to remove every buff in the buff database from the player's character. cheat_add_buff_heal - Now restores health, stamina, hunger, and exhuast in addition to bleeding and injuries. cheat_add_buff_immortal - Now calls cheat_add_buff_heal before adding immortal buffs. cheat_remove_all_perks - Attempts to remove every perk in the perk database from the player's character. cheat_add_all_items - Adds all items in the item database to the player inventory which is about 5300 punds of items. Don't worry somehow you can still walk. cheat_add_stat_xp -- Adds XP to the a player's stat like str. All of this information is available in game by running "command-name ?". Executes the given Lua code. This is not a cheat it is used for testing and debugging. This instantly saves your game. No item requirements or save limits. Finds all of the buffs that match the given token. token: (optional) All or part of a the buff's name. Leave empty to list all buffs. Adds the given buff to the player. id: (required) The buff ID or all or part of a the buff's name. Uses last match from cheat_find_buffs. Removes the given buff from the player. Removes all buffs from the player. Stop bleeding, removes injuries, and restores all health, stamina, hunger, and exhaust. Adds buffs to make the player immortal. Use cheat_remove_buff_immortal to remove this. Removes the buffs making the player immortal. Adds invisible buff to player. For now this just sets conspicuousness to zero. Use cheat_remove_buff_invisible to remove this. Removes invisible buff from player. Find and display stats of horses. token: (optional) All or part of a horse's name. Leave blank to list all horses. Teleports your horse to you. Finds all of the items that match the given token. token: (optional) All or part of a the item's name. Leave empty to list all items. Adds an item to the player's inventory. amount: (optional number) The number of items to add. Default 1.
health: (optional number) The condition of the item added. Default 100.
id: (required) The item ID or all or part of a the item's name. Uses last match from cheat_find_items. Removes an item to the player's inventory. amount: (optional number) The number of items to remove. Default 1. Removes all items in the player's inventory. THIS DELETES YOUR INVENTORY! Move items you want to a stash first. Removes all stolen items from your inventory. Makes you the owner of all stolen items in your inventory. This removes the stolen flag from the item. Repairs all damaged items in your inventory. This can uneqip items so don't do this in combat. Damages all weapons and armor in your inventory. This can uneqip items so don't do this in combat. health: (required number) The item health/condition to apply between 0 and 1. Flags all merchants so they accept stolen goods. Restarting the game reverts this effect. Finds all of the perks that match the given token. token: (optional) All or part of a the perk's name. Leave empty to list all perks. Adds the given perk to the player. id: (required) The perk ID or all or part of a the perk's name. Uses last match from cheat_find_perks. Adds all perks to the player. exclude: (required boolean) If true then negative, test, and obsolete of perks are excluded. Removes the given perk from the player. Removes all perks from the player. Use F1 key to toggle hover on and off. This uses physics to push the player slightly up. This is intended to be used with F2 push. Use F2 key to toggle push on and off. This uses physics to push the player forward. This is intended to be used with F1 hover. Use F3 key to toggle sprinting on and off. This uses physics to push the player forward (and down for friction). This disables the lockpicking minigame on stashes and automatically opens the stash for looting. This disables the lockpicking minigame on doors and automatically opens the door. This calls cheat_no_stash_lockpicking and cheat_no_door_lockpicking. This disables the pickpocketing minigame and automatically opens the person's inventory for looting. They can still catch you. Opens the player's stash. This only works if you have unlocked at least 1 stash. Teleports the player to the given coordinates. You can end up in the air or under the map. I suggest saving your game and turn on immortality first. Sets one of the player's states to the given value. state: (required) One of: health, exhaust, hunger, or stamina. value: (required number) The number to assign to the given state. Adds XP to one of the player's stats. stat: (required) One of: str, agi, vit, or spc. xp: (required number) The desired XP to add. Sets one of the player's stats to the given level. level: (required number) The desired level for the given stat (max 20). Level cannot lowered. Adds the given amount of groschen to the player's inventory. amount: (required number) The amount of groschen to add. Enabled or disables the bow reticle. Won't take effect if bow is drawn. Set or clears the player's wanted level. This doesn't affect faction reputation. Washes all blood and dirt from the player and player's horse. Saw this code to unlock recipes in a pak file. I have no idea what this really does or if it works. Regenerates the given player state over time; pulses once per second. amount: (optional number) The amount to regen every second. state: (required) The state to regen: all, health, stamina, or exhaust. Finds all of the skills that match the given token. token: (optional) All or part of a the skill's name. Leave empty to list all skills. Sets one of the player's skills to the given level. level: (required number) The desired level for the given skill (max 20). skill: (required) The skill name, full or partial, or ID. Use cheat_find_skills to list all skills. Reveals the entire map (removes fog of war). Logs information about game time. Moved time forward the given number of hours. hours: (required number) The number of hours. Set the game time speed as a ratio between real time and game time. A high ratio, like 1000, is faster. Default is 15. 0 will pause time. ratio: (required number) The ratio between real time and game time. Default 15. Finds and kills all the killable NPCs within the given radius of the player. token: (required) All or part of a the NPC's name. radius: (optional number) The kill radius around player. Default 5. Finds and shows information about an NPC. This only works if the NPC has been loaded into the world. Teleports one or more NPCs to the given coordinates. Use cheat_loc to get locations. max: (optional number) The maximum NPCs to teleport. Default 10.
x: (required number) X coordinate. y: (required number) Y coordinate. radius: (optional number) The teleport radius around the x,y,z target. Default 5.
z: (required number) Z coordinate. 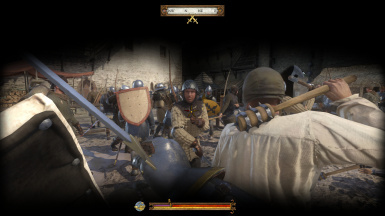 Teleports one or more NPCs to the player's location. radius: (optional number) The teleport radius around the player. Default 5. Tracks the entity being targeted by the player. This will allow you to use other commands on the entity. This command is bound to the F4 key. Kills the entity targeted using by F4 or the cheat_target_entity command. Spawns bandits, cuman, or animals. For some reason most of the animals and some bandits/cuman just stand around. No idea why. The spawned entities are not managed so you should kill them off or load a clean save. count: (optional number) Number of things to spawn. Default 1.
radius: (optional number) The spawn radius around the player. Default 5. Searches through the database of souls and spawns 1 NPC for each match. This is intended to be used to spawn specific NPCs. The list of souls is in v_soul_character_data.xml in tables.pak. token: (required) The sould ID, all/part of the soul name, or all/part of localized soul name. Sets the weather to the given weather ID. delay: (optional number) The number of hours to delay the transition. Default 0.
id: (required number) The weather type ID. Sets the number of milliseconds to delay execution of the next command. ms: (required number) The number of milliseconds to delay the next command. file: (required) The file to execute. This command does nothing and is here for documentation only. 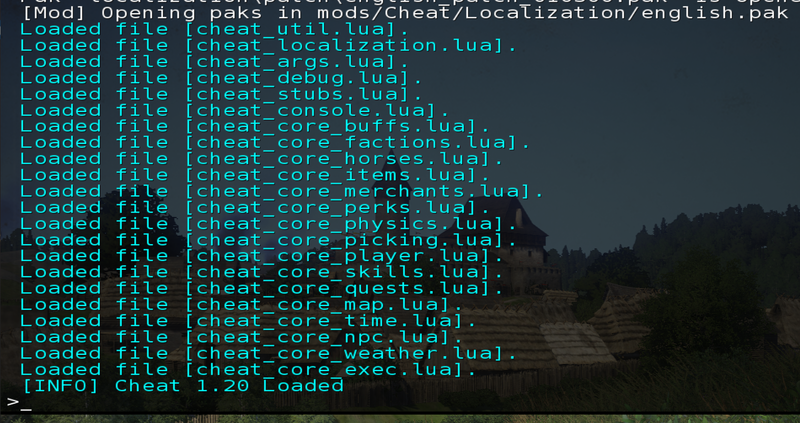 You can run cheat commands automatically when a level loads by placing them in file Datautocheat.txt. This is useful for commands that are not permanent.